Es gibt mal wieder einen Brettspiel-Kickstarter! The cooperative version of the game, we recommend as the default base game, is an intense very interactive 75-120 minute game. 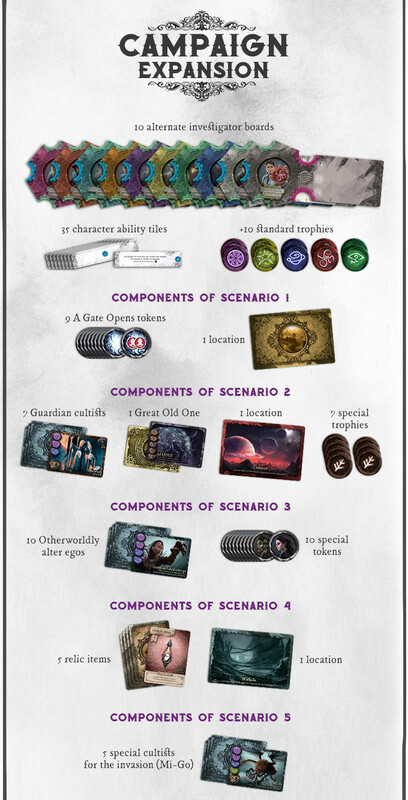 In the narrative game mode we can use the Script Book which will make the game longer, but very immersive, creating an atmosphere as if we were reading one of Lovecraft’s short stories. With the „Behind the Scene“ expansion we can bring an Overlord into play, that is a player who is going to play against us. As our common enemy, they will be the one playing in place of the game. 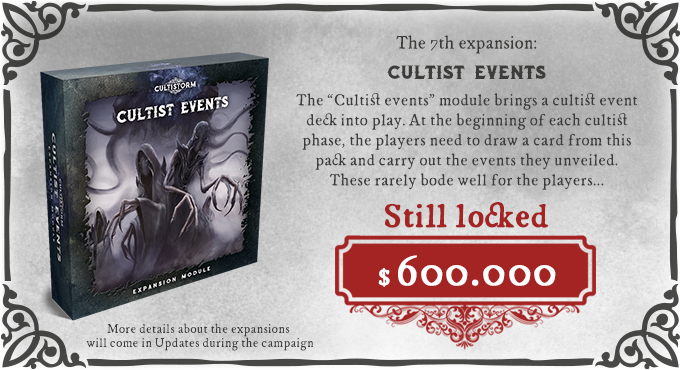 In the „Storm of Cultists“ campaign expansion we created a seven-part campaign experiance with consecutive stories and quests. 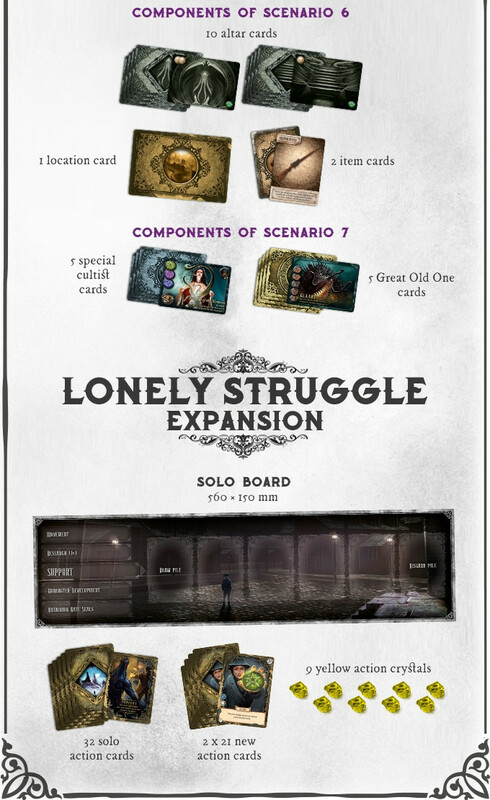 And with the „Lonely Struggle“ expansion we add a solo gameplay. 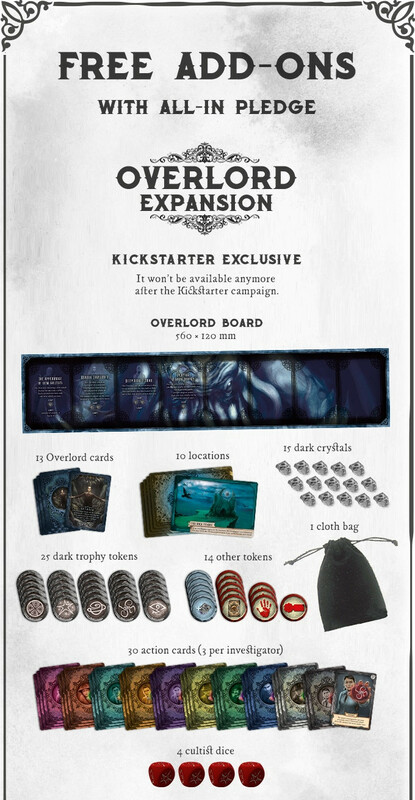 There are also nine more expansion modules to make the game more varied, complex and enjoyable. 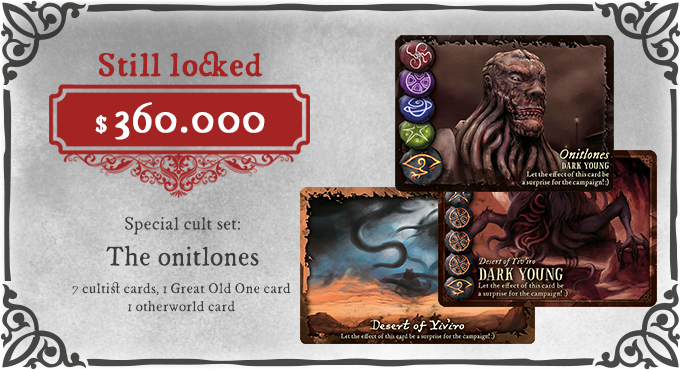 We have devised a very efficient way to help your immersion into the Lovecraftian atmosphere of Cultistorm: we bring you a script book with over 400 flash fiction stories. 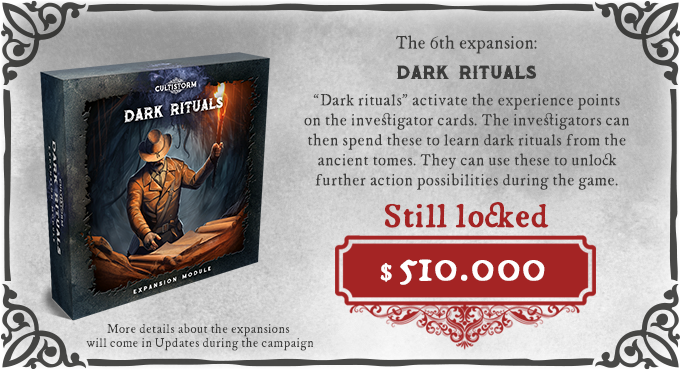 Every character and every location (may it be of this world or another), the investigators, the cultist casts, the different events all get their own story. You can also read a flash fiction piece before an encounter with a cultist which does not only intensify the gaming experience, but can also have an effect on the encounter. The stories arrive to you in a beautiful printed book with full page colour illustrations. We would like to make the game as immersive possible so instead of flavour texts on cards we are writing short stories together with a team of talented weird fiction writers. 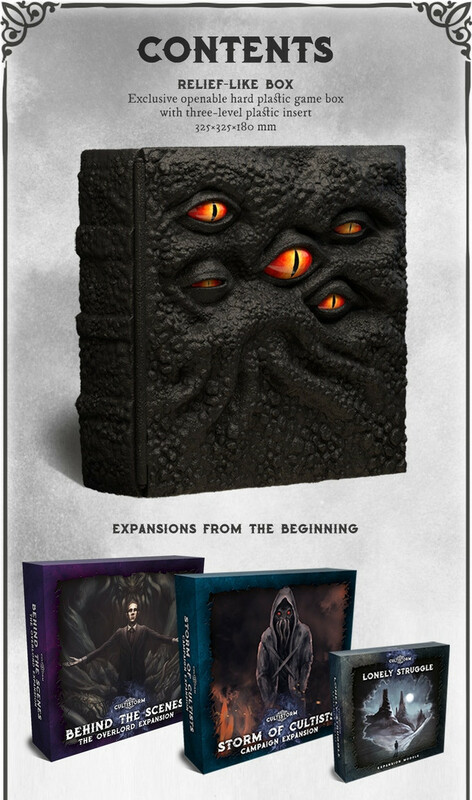 We give a complete volume of short stories along with the game, which is worthy of Lovecraft’s literary heritage and the genre requirements he created. 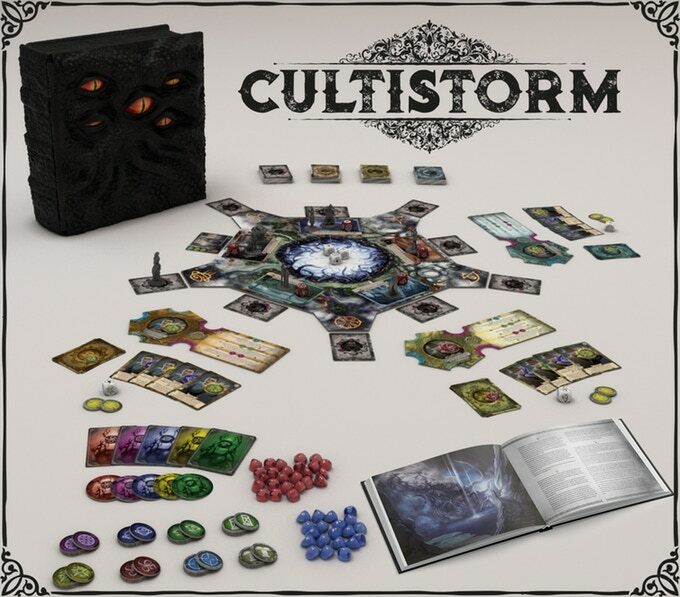 The short stories are directly connected to the different casts of cultists, locations and Great Old Ones appearing in the game, creating such a detailed world and back story which is quite unusual in the case of board games. If you feel like listening to some music while reading or playing, you can turn on Graham Plowman’s album he created especially for Cultistorm. Graham is perhaps the most acknowledged composer of the Lovecraftian subculture. He creates this Lovecraftian atmosphere with a mixture of symphonic orchestras and choir music, using instruments from in Lovecraft’s time. His music is powerful, authentic and incredibly high quality. 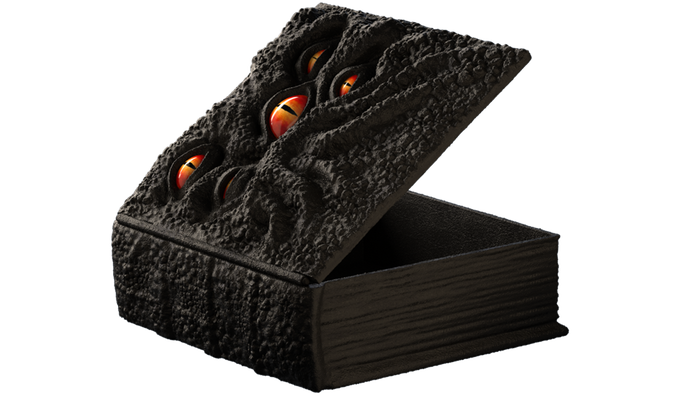 We’ve created beautiful special edition box for the game and to be honest we, the creators of the game, fell in love with it right away. It’s a unique and very fitting “packaging” for our game which expresses the uniqueness of its idea and quality. UNCOMMON CAMPAIGN MANAGEMENT: EVERYTHING IS FOR YOU! We didn’t plan any paying add-ons for the campaign. 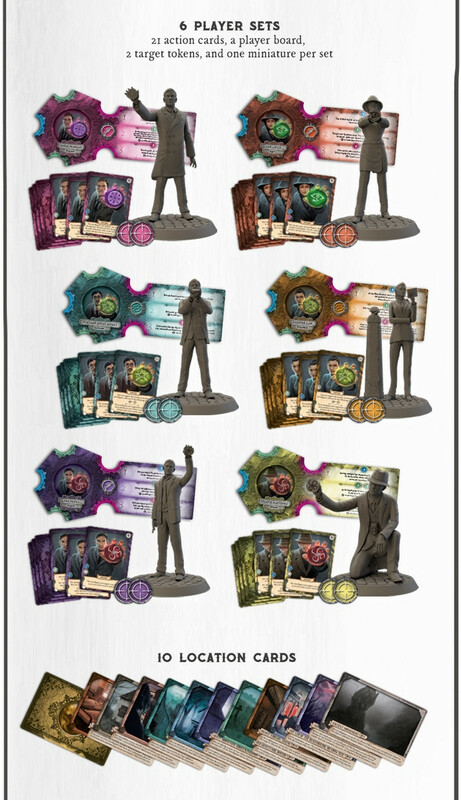 We would like to give you all the elements, all expansions and booster packs as Stretch Goals and to give them along the base game for free without any extra costs. 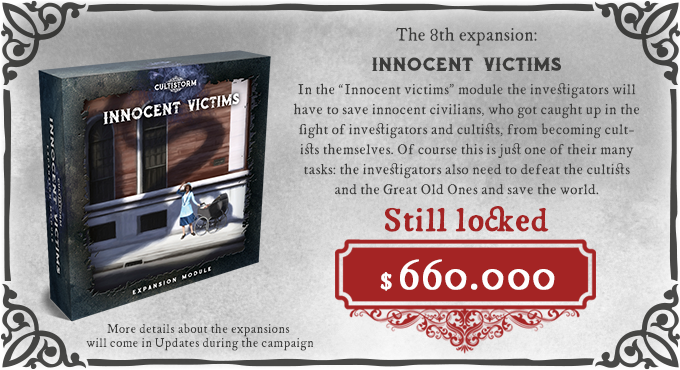 We want to inspire you, that’s why all the Stretch Goals will be visible from the launch of the campaign. 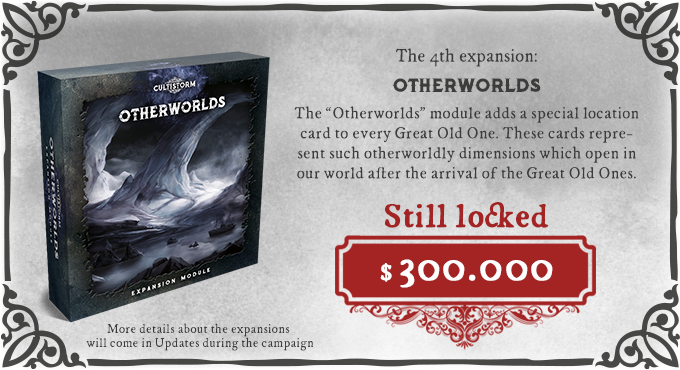 If there any expansions or elements we don’t reach as Stretch Goals until the end of the campaign (but we hope it will not happen), we will make sure that they become available in the Pledge Manager after the campaign. We would like to put together a campaign which fulfills your expectations and makes you happy. We are trying to answer any questions that arise – please read the FAQ. 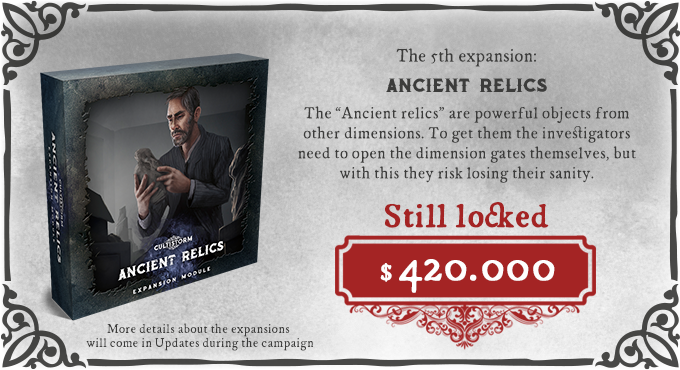 In our Kickstarter Updates we will show you the details our game and expansions, our background stories, short stories and scipts, soundtrack albums and everything that may interest you. Die Kampagne ist schon fast finanziert und läuft noch über einen Monat. und das wird es wirklich komplett in Deutsch geben? 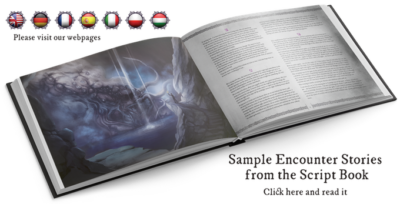 ok wer lesen kann ist klar im Vorteil, es braucht 1500 Backer für eine Deutsche Version aktueller Stand ist 164/1500. Das stimmt mich jetzt nicht 100% euphorisch, den für die englische Version kann ich garantiert wieder nicht genug Spieler gewinnen. Zumindest die bisherige deutschsprachige Homepage lässt da schlimmes erahnen. Man merkt sofort, dass das kein Muttersprachler war, es liest sich unheimlich holzig und ist voller Rechtschreib- und Grammatikfehler. Wenn man nicht auf eine deutsche Fassung angewiesen ist, würde ich auf der Basis von der deutschen Fassung abraten. Vielleicht wurde die HP ja auch nur billig mit Hilfe von Google Translate und Co. übersetzt. Es bleibt aber die Hoffnung, dass für eine Sprachadaption des Spieles ein professionelles Übersetzungsstudio engagiert wird. Wenn ich mir so die Textmenge ansehe… das wird teuer mit der professionellen Übersetzung. Ich finde es auf den ersten Blick ganz spannend, aber bei der Plastikboxen zusammen mit dem Satz „wasn’t motivated by busisness reasons“ (auch wenn es bestimmt anders gemeint ist), macht mir Sorgen, ob das später alles so reibungslos ablaufen wird. Bestes Beispiel ist für mich da Kingdom Death mit zig Verzögerungen (aktuell ohne neues Datum), Preiserhöhungen und Dingen, die dann doch gecancelt wurden.